Star Wars Celebration 2019 is now taking clearer shape, as the annual festival has announced an expanded lineup of guests, while also dropping a fantastic piece of poster art for the event! Check out the official Star Wars Celebration 2019 poster below, and scroll down for the lineup of guests who have just been announced! 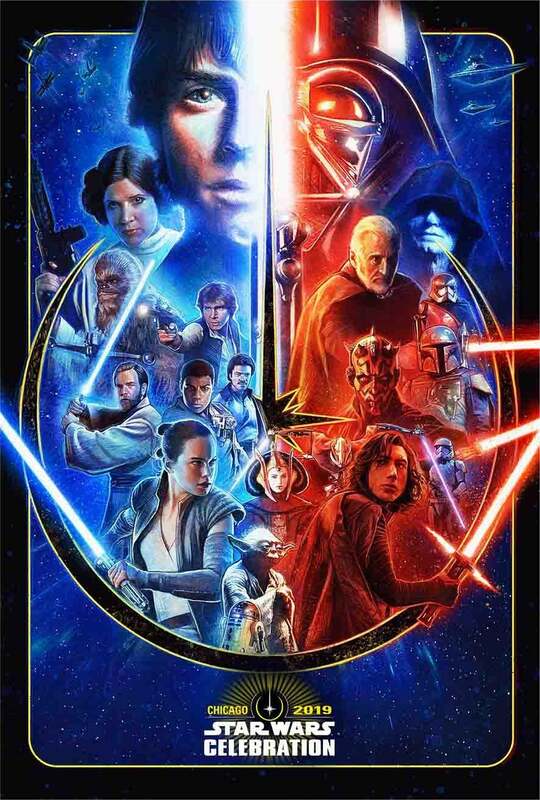 The new poster does a great job of bringing all of the Skywalker Saga together in one visual image; in fact, it wouldn't be surprising of this sor of poster or banner design became a franchise norm, once the tale of the Skywalker bloodline is finished off by the upcoming Star Wars: Episode IX. That film's release is going to make next year's Star Wars Celebration truly a milestone. "The Finland native, who has donned the walking carpet costume in Solo: A Star Wars Story, The Force Awakens, The Last Jedi, and more, taking up the mantle as everyone’s favorite Wookiee, is just one of many Star Wars actors and Celebration first timers joining you for the ultimate fan event this spring." "Meet Suotamo at the Topps autograph area along with Sam Witwer, who brought Maul to life in Star Wars: The Clone Wars, Star Wars Rebels, and recently as the voice and other half of the horn-headed Zabrak to Ray Park’s performance in Solo: A Star Wars Story." "Greg Grunberg, who has brought Resistance X-wing pilot Snap Wexley to the screen in The Force Awakens, will also be there alongside: Dave Chapman, the puppeteer who has helped bring BB-8, Rio Durant, and Lady Proxima to life in the sequel trilogy and Solo: A Star Wars Story; Greg Proops, who has lent his voice most recently to Star Wars Resistance as Jak Sivrak and Garma, and previously voiced Fode in The Phantom Menace; Paul Kasey, who played Admiral Raddus in Rogue One: A Star Wars Story and Ello Asty in The Force Awakens; Ian McElhinney, who played General Dodonna in Rogue One: A Star Wars Story; and Orli Shoshan, Shaak Ti in Attack of the Clones and Revenge of the Sith." Star Wars Celebration Chicago is being held April 11th - 15th. Visit StarWarsCelebration.com for tickets and more info! Star Wars: Episode IX will be in theaters on December 20th.